We arrive on the first stage of our tour of South East Asia, in Pattaya, where we are to be married. 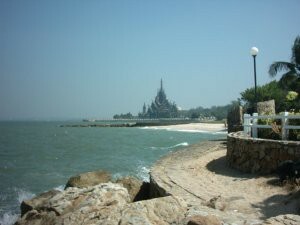 Pattaya is 147km SE of Bangkok, and is Thailand’s most successful beach resort. 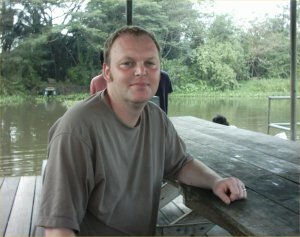 Most of the people I saw in Thailand, used mopeds and motor bikes as transport. 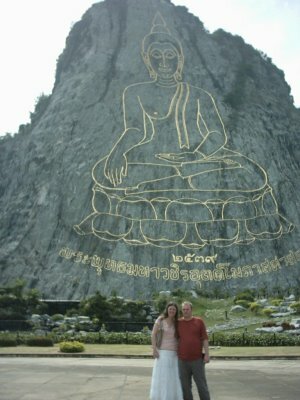 Travelling in this country, like most of Asia, is an exciting experience. 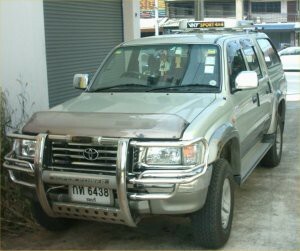 Sarah’s Dad drives this 4×4, which is easily the safest form of transport. 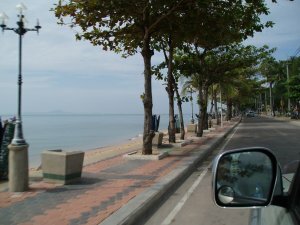 The beach road and walking street, are the most “happening” parts of Pattaya. We drive along the road, and enjoy the view out to Sea. We drove up the coast to Jomptien beach to escape the crowds. we have lunch at a beach side restaurant listening to the sound of the waves. The steak here, was delicious. We visited a monument to celebrate the kings birthday. The Royal family are revered in Thailand, criticising them in public, will almost certainly end in violence or arrest !. 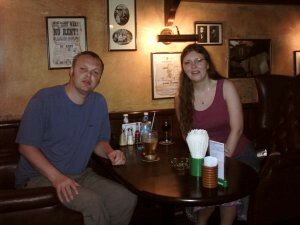 In the evening, we went around a few of the bars. One of them, is semi famous for look alike singers. The main highlight of the show, was Tina Turner and her backing singers. 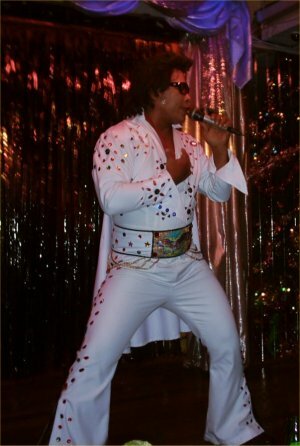 Although he was obviously Thai, “Elvis” really had the kings moves, and definitely got the crowd going. 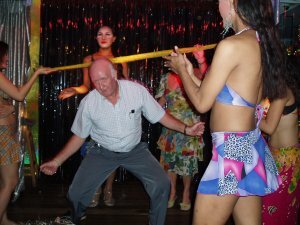 At the end of the show, everyone got up dancing, and had a go at the Limbo. The girls were a lot more supple than us, but we had a go anyway. 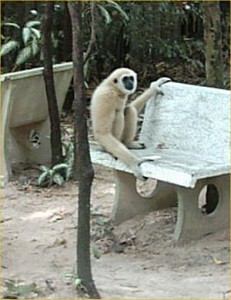 Frank had only arrived that day, it was great to see him again. He started working in Bangkok, and made his way to Pattaya to join us. I walked about 8 miles along the shore, until I came to this building. 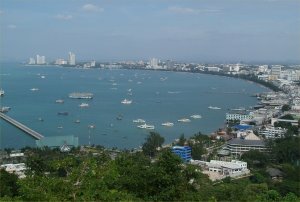 Pattaya is well known as an adult playground. A nearby gun club, gave me the opportunity to try my hand at shooting. 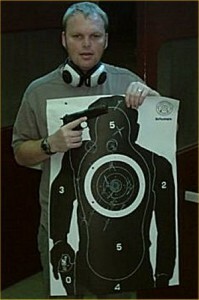 I fired a few practice shots with a .32 revolver before trying out some more exciting guns. The colt 45 Model 1911 (so named as it had been designed in 1911). 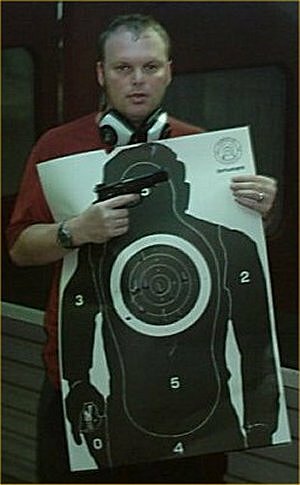 It has heavier calibre bullets, that give a real kick when shooting. The downside is, its less accurate that smaller calibre guns, and can fire less bullets between re-loading. 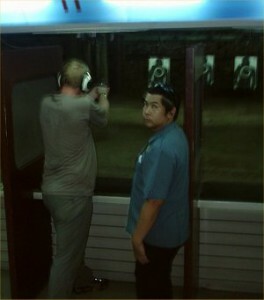 I went back the next day, to try a different gun. The Berreta 92 (used in Lethal Weapon, Die Hard and just about everything since). The smaller calibre rounds give less of a kick and are more accurate as you can see from this picture. It can also hold a lot more bullets. Sarah and I go out for the evening. Here Sarah sits in an appropriately named Baat Taxi. You get one circuit of beach road and 2nd road, for 10 Baat (about 15 pence). 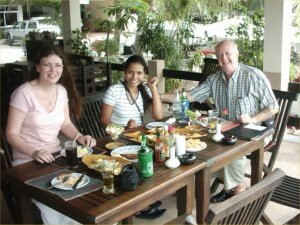 When I first met Sarah, she had just returned from a trip to see her dad in Pattaya. She told me enthusiastically about an Irish bar called Shenanigans, and how much she enjoyed it there. 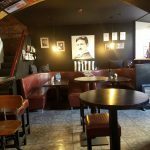 Here 3 years later, we sit together, in the same bar. The Beef and Guinness Pie was superb. 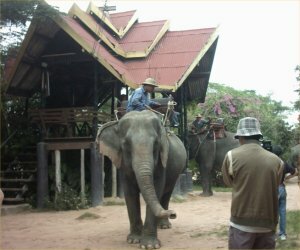 We drove out of Pattaya, to visit the Elephant village. 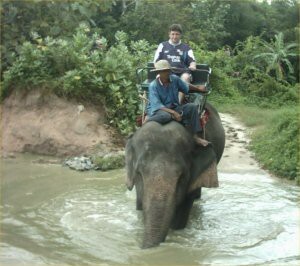 They actually have a special tower with stairs, to enable you to climb onto the elephant more easily. Sarah and I, on our elephant. 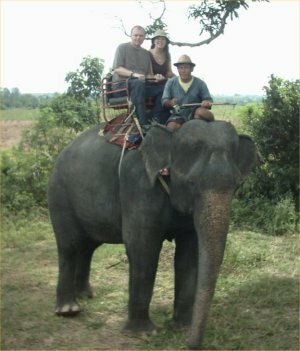 The Elephant master normally sits on the Elephants neck. Unfortunately, on this occasion, he had to answer a call of nature. 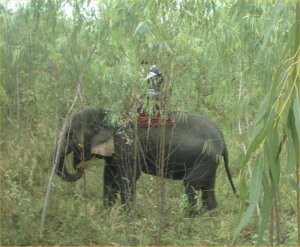 For 10 minutes, Frank was convoyed around the forest at the whim of the Elephant, as it searched the forest for food !. Part of the trek, took us through deep water. They are so well balanced, that when they walk, they have to hold their arms above their shoulders. Imagine my delight when we got to actually meet them in the forest. 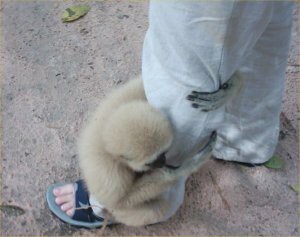 As we were led on a trek through the jungle, by our guide, one of the Gibbons (which were really friendly) hitched a ride with Sarah. Our guide showed us different types of plants, to cure upset stomachs and other ailments. Especially interesting was “shy” grass, which closes, when its touched. 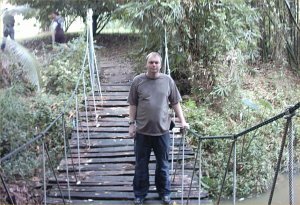 Me on a tropical rope bridge, as we trekked through the jungle. It was here, that for no particular reason I learned how to tell real silk from imitation. If you burn a small piece of it, nylon and the like will shrivel, where silk will turn to Ash. Although this looks like a lakeside bar, its actually a raft, which we took across the lake. We drank beer during the crossing and Sarah gave the Gibbons some Cherry aid. 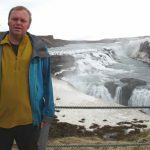 Many people know of my interest in bushcraft. 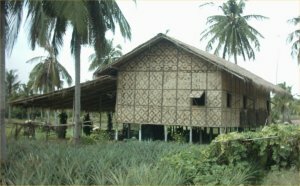 Here we visit a large bamboo shelter. When I say large, a hundred people could congregate in it, with ease. 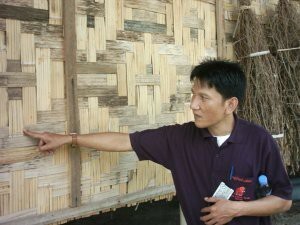 Our guide shows us the construction of the shelter. Flat pieces of bamboo are woven together to make the walls, which are amazingly robust. We are driven back to the centre for lunch, in an ox cart. 25 mph doesn’t sound like much, but in a vehicle with no suspension, and wooden wheels, it was exhilarating. 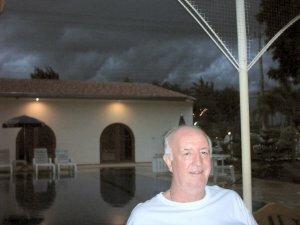 The night before we flew out to Saigon, the worst storm I had ever seen, was brewing. The locals must be used to it, as Ray just laughed.